I use this as my location for the, "House of Dreams" agenda. I find that I can reduce most of my "Ally" characters to 1 or 0 gold, & rush out 2x as many characters. 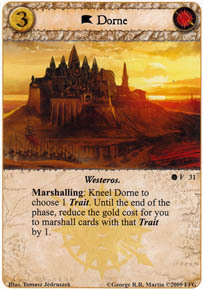 Plus the game changer is the combo: Dorne + Hellholt Engineer x3 + going as close to last in the Marshalling phase as possible = Martell rush. That way you can kneel, "Dorne." As soon as the Marshalling phase starts, name a trait, & then stand it, if you have a "Hellholt Engineer" in play any time an opponent kneels a location during their Marshalling turn!